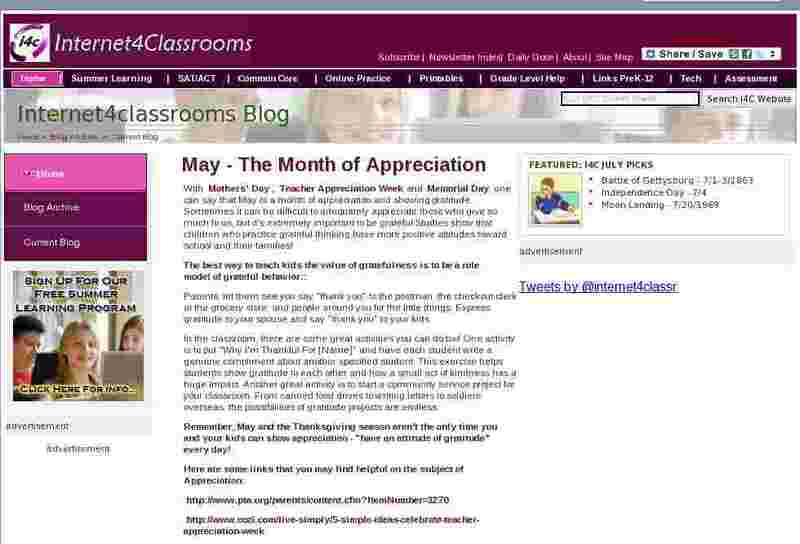 With Mothers' Day, Teacher Appreciation Week and Memorial Day, one can say that May is a month of appreciation and showing gratitude. Sometimes it can be difficult to adequately appreciate those who give so much to us, but it's extremely important to be grateful. Studies show that children who practice grateful thinking have more positive attitudes toward school and their families! Parents, let them see you say "thank you" to the postman, the checkout clerk at the grocery store, and people around you for the little things. Express gratitude to your spouse and say "thank you" to your kids. In the classroom, there are some great activities you can do too! One activity is to put "Why I'm Thankful For [Name]" and have each student write a genuine compliment about another specified student. This exercise helps students show gratitude to each other and how a small act of kindness has a huge impact. Another great activity is to start a community service project for your classroom. From canned food drives to writing letters to soldiers overseas, the possibilities of gratitude projects are endless. Remember, May and the Thanksgiving season aren't the only time you and your kids can show appreciation - "have an attitude of gratitude" every day! http://www.nmam.org/ (Official Website for Military Appreciation month). Thank you for reading our blog! Thank you for using our website!